Parallel Kingdom is a Mobile Multiplayer Trans-Reality Game (That's MMTRG, acronym fans) for the iPhone (obviously) and phones running Android (ooh!). 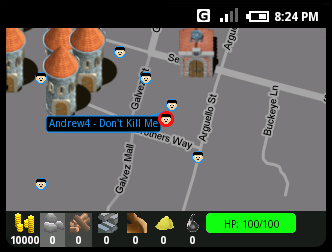 The game overlays a simple 2D medieval RPG on a map of the real world - tracking your position via your phone's built-in GPS. You can do all the usual RPG-type-stuff: PvP, trading, item crafting and building strongholds, competing against other players who wander too close to your personal space.This video gives you the gist - although it is slightly fanciful compared to the actual gameplay.